Charred fresh corn, avocado and chile peppers are tossed with a vibrant tomatillo guacamole and spicy mayonnaise-cojita cheese dressing in this creamy salad. Serve as simple lunch or with roasted meat and pilaf for special occasions. RecipeSavants.com Charred fresh corn, avocado and chile peppers are tossed with a vibrant tomatillo guacamole and spicy mayonnaise-cojita cheese dressing in this creamy salad. Serve as simple lunch or with roasted meat and pilaf for special occasions. Smart Recipes, American Recipes, Dairy Recipes, Recipes Dairy American Charred Corn Salad With Creamy Tomatillo Dressing PT31M Serves 4 Ingredients: 0.25 Cup Fresh Cilantro 6 Ears Fresh Corn 2 Tablespoons Canola Oil 0 To Taste Kosher Salt & Freshly Cracked Black Pepper 1 Fresno Chile Pepper 0.5 Small Red Onion 3 Limes 0.5 Cup Mayonnaise 1 Tablespoon Hot Sauce 1 Teaspoon Chili Powder 0.75 Cup Cotija Cheese 1 Teaspoon Cumin 0.5 Cup Tomatillo Guacamole Coat each ear of corn with the canola oil evenly and sprinkle with kosher salt and black pepper. Preheat a grill pan over high heat and cook corn for about 2-3 minutes per side. Remove from pan and keep aside for about 5 minutes. Stand each ear in a wide, shallow bowl, stalk-end down and with a knife, slice the kernels off. 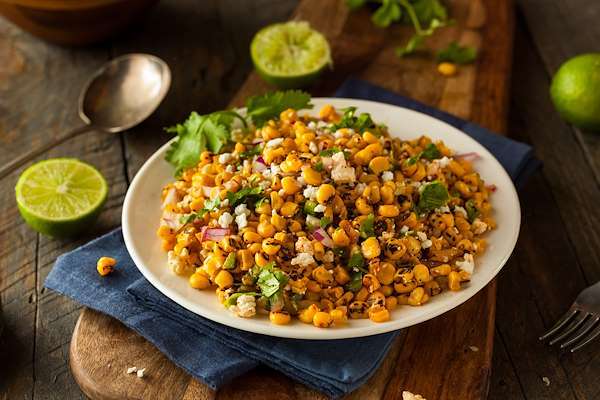 In a large bowl, mix together corn kernels, avocado, Fresno chiles, finely chopped red onion and juice of 3 limes. For creamy tomatillo dressing: In a bowl, add ½ cup of tomatillo guacamole (recipe associated), mayonnaise, hot sauce, cumin and chili powder and mix until well combined. Place dressing over corn mixture and toss to coat well. Gently, fold in remaining cotija cheese, ¼ cup of cilantro and a pinch of salt. Serve immediately.